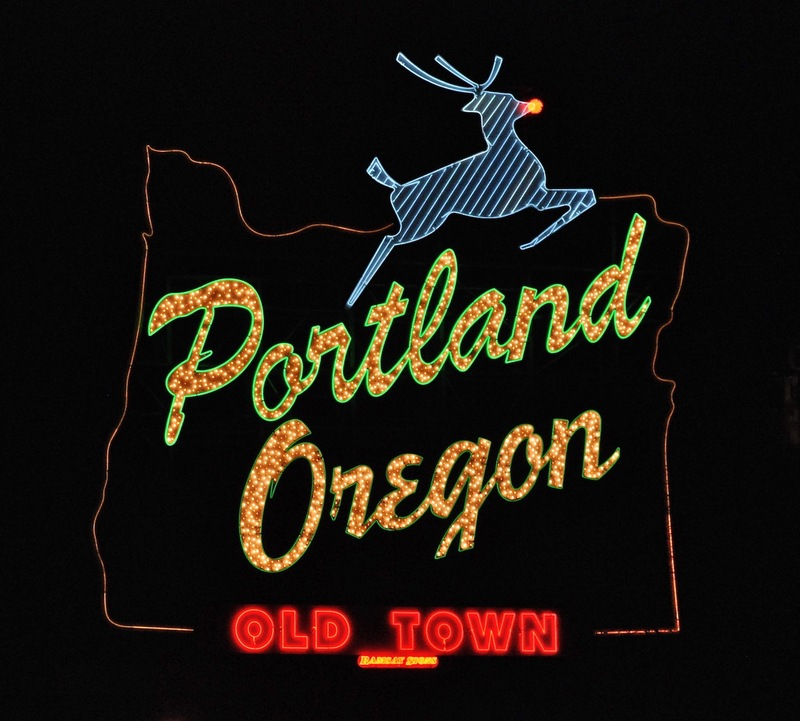 Even Portland’s famous white stag gets into the holiday spirit every year! It’s hard to believe that Thanksgiving has already passed us by and that it’s now time for us to present Portland’s Holiday Happenings for 2018, fully updated for this year’s events, but it’s true! We’ve included a little something for everyone, but if you can’t find what you’re looking for here, check out PDXPipeline or the Events12 December Guide. There’s LOTS to choose from if you’re looking to celebrate! Portland’s holiday hubbub kicked off at Portland’s tree lighting and caroling event in Pioneer Courthouse Square. Although the singing has subsided, the region’s largest Christmas tree will be lighting up Pioneer Courthouse Square all season long! Winter Wonderland Nov. 23 – Dec. 26. This drive-through light show at Portland International Raceway is billed as the largest display of holiday lights west of the Mississippi! 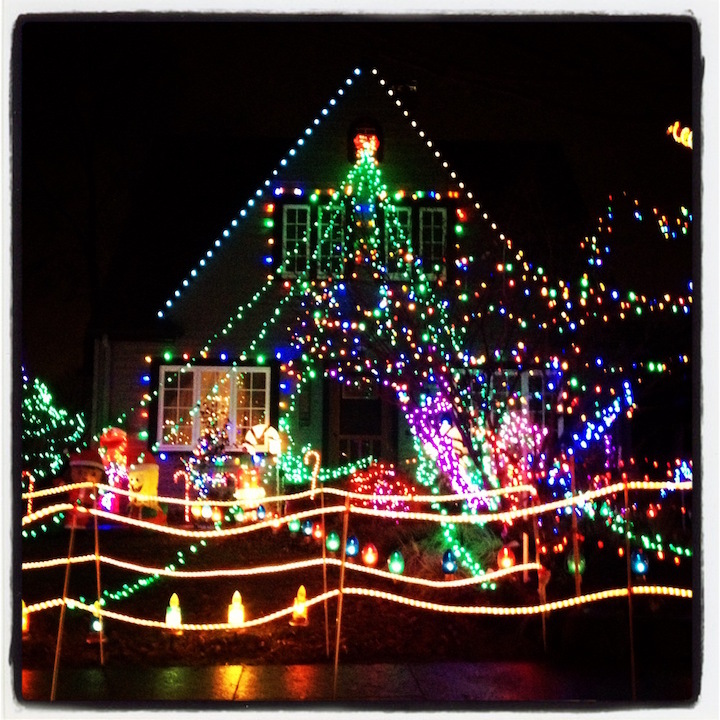 Christmas Festival of Lights Dec. 1-30. Thousands and thousands of lights are strung through the Grotto’s beautiful grounds, making this a peaceful place to spend an evening. Carolers perform on most nights, too (including the fantastic Jesuit HS choir on December 11). Zoo Lights Nov. 21 – Jan 5. All kinds of fun animal-themed light displays decorate the Oregon Zoo. Not sure how the animals feel about it, but it’s a patron favorite! Parking can get crazy. Consider riding MAX directly to the Zoo stop. Christmas Ships Dec. 1-20. With two rivers running through town, we’ve got lots of people with boats, and they like to celebrate in style. You can watch from the river’s edge or go to one of the many restaurants on the river for a warmer viewing spot. Christmas in the Garden Dec. 1-31. This light festival and German marketplace at the Oregon Garden even has an outdoor ice rink! If you’ve been longing to skate outdoors ever since Lloyd Center put that darn roof on, here’s your chance. (Although it occasionally snows at the indoor Lloyd rink!) The Oregon Garden is a beautiful spot. Festival of Trees Nov. 30-Dec. 1. Elaborately decorated Christmas trees, mini-trees, wreaths and holiday displays await those who head to the Oregon Convention Center to get into the holiday spirit. Hands-on fun include frosting cookies and patching up stuffed animals at the Teddy Bear Hospital. The event is hosted by Providence Health, and proceeds benefit cancer research. Portland Menorah Lighting Dec. 2-9. The annual lighting of the Portland Menorah, nightly during Hanukkah in downtown’s Director Park. The first lighting event begins at 4:00 p.m. with music, foods, and children’s crafts. Peacock Lane Dec. 15-31. A Portland tradition since the 1920s. We’re lucky we live just blocks from Peacock Lane, so we get to visit every year. It’s quite a quaint little tradition that makes Portland feel like a small town. Pedestrians only on Dec. 15-17. Maddax Woods Nov. 17-Dec. 31. Enjoy a magical walk down a lighted, accessible path through West Linn’s Maddax Woods to a viewing platform on the Willamette River. Pittock Mansion Nov. 19-Dec. 31. Prefer to stay indoors? Wander the themed rooms of Portland’s Pittock Mansion and enjoy beautiful views of the city as well. From opera to knitting to beekeeping, this year’s Pittock Mansion Christmas will highlight some familiar and not-so-familiar hobbies and pastimes. Want to Get Cultured up with a Little Music or Theater? A Christmas Carol Portland Playhouse, Dec. 1-29. I’ve seen it so many times, and I still want to go this year.The classic Christmas tale. 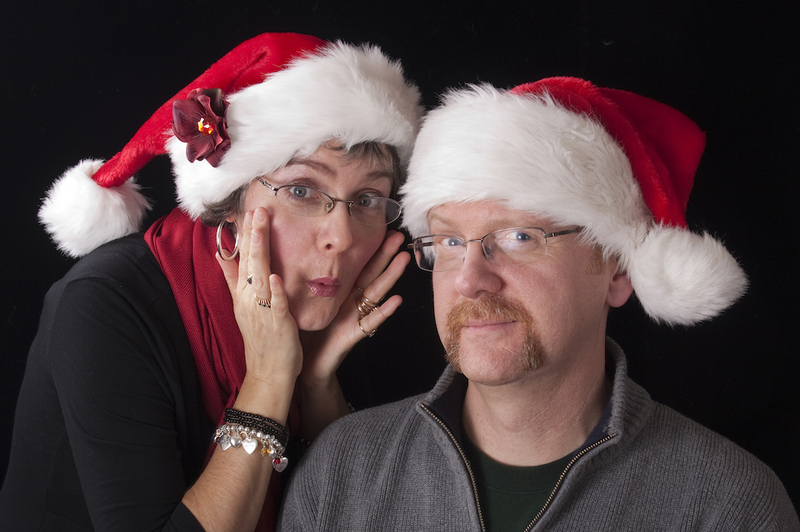 Twist Your Dickens Portland Center Stage, Nov. 27 – Dec. 23. Riffs and parodies of A Christmas Carol and nearly every other holiday tradition with an uproarious troupe of talented improv performers. A 1940’s Radio Christmas Carol Broadway Rose Theater, Nov. 21 – Dec. 23. Step back in time to Christmas Eve, 1943, as the Feddington Players present A Christmas Carol live on-air. After endless interruptions, technical snafus, and theatrical missteps threaten to tank the broadcast, the company improvises a film noir spin on the classic Dickens tale. Singing Christmas Tree Keller Auditorium, seven performances between Nov. 23 – Dec. 2. Get your tickets soon if you’re hoping to see the world’s largest living Christmas tree. Great Figgy Pudding Caroling Competition brings together caroling groups of all ages. Friday, Dec. 7 from 5:30–7:30 p.m. The Nutcracker Oregon Ballet Theater, Dec. 8-26. A holiday classic. 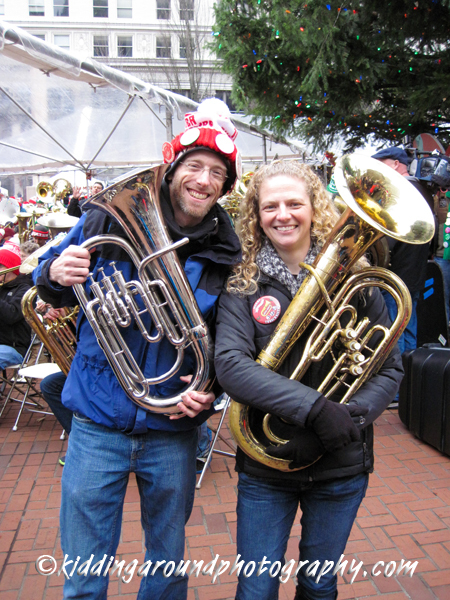 Tuba Christmas Pioneer Courthouse Square, Dec. 8. It starts at 1:30 p.m., but get there early if you want to sit down. Really early. If you haven’t been before, you should really check it out. Many other cities have them as well. We’ve even been to one in Punta Gorda, Florida! Christmas films are being featured all month at McMenamins’ Mission Theater, if beer & popcorn are more your style! Hungry? Along with a pickled herring eating contest, Joulupukki (Finland’s Santa Claus) will be at Portland’s annual Scandinavian festival, ScanFair, going on Dec. 1-2 at the Memorial Coliseum. We’re betting they have some tastier-than-herring Scandinavian treats available as well, and you can even get your photo taken with Joulupukki! Thirsty? It just wouldn’t be Portland without a beer festival, and the folks sponsoring the Holiday Ale Festival will be ready to get the season off to a great start in a giant tent at Pioneer Courthouse Square, and it’s running for FIVE days this year: from Nov. 28-Dec. 2. Prefer cider to beer? East Burn’s 2018 Cider Fest, featuring 13 cideries, takes place on Dec. 1 from 4 p.m. to 10 p.m. (or until the cider runs out!). Patrons who bring in donations for Toys for Tots will receive five extra tasting tokens per toy donated. Need to do Some Shopping and See Santa? Portland’s Saturday Market is a fantastic opportunity to buy handmade gifts from over 250 local artisans. The gifts range from food to clothing to fine art and everything in between. Usually open only on Saturdays and Sundays from March until Christmas, the Festival of the Last Minute has the market open every day of the week leading up to Christmas Day! Pioneer Place’s Hipster Santa is about as Portland as one can get at the holidays. Santa will be in his Portland hipster threads again this year on Thursdays, seated in his PDX carpet chair. Starts Nov. 29th, with Hipster Santa Pet Night on Nov. 26 and additional Hipster Santa days on Dec. 1-2 . Looking for Unique Holiday Fun? Santacon is, well, hard to define. Portland has two of them: Stumptown Santacon and NoPDXAnticon. If you’ve stumbled across dozens, even hundreds, or perhaps thousands, of folks dressed up in Santa costumes presumably in the midst of a pub crawl, you’ve seen it. But even those who participate sometimes have a tough time nailing it down, and there’s even controversy about which version is the authentic / original / best one. From our perspective, they all look like a good time! Sing Along Messiah events provide an opportunity to join a huge holiday choir and belt out Handel’s masterpiece in four-part harmony. Several events dot the calendar in December, but the biggie is held at Central Lutheran Church, on Dec. 14. Highly recommended – we joined hundreds of folks and even got chills during the mighty Chorus! Holiday Express takes riders back in time in vintage rail cars powered by a steam locomotive. Santa and his elves are along for the 45-minute round trip ride that passes through Oaks Bottom along the Willamette River. Weekends, Nov. 23 – Dec. 16. Give Back with Hands On Portland, which posts a calendar of volunteer opportunities for those who’d like to spread some cheer during the holidays. For those who prefer to let their fingers do the walking, Willamette Week’s Give Guide makes it easy to support – via online donation – any or all of 150 non-profits that impact the Portland area. Ugly Holiday Sweater Run is a free 5K run/walk in Tualatin that benefits Ladybug CDH Foundation by collecting items for families in the NICU. Dec. 22 – just in time to work off those Christmas cookies you’ll be eating! Enjoy your holiday happenings this season in your hometown, whether they’re for a day, a week or a weekend! Thanks for the mention for the Ugly Holiday Sweater Fun Run!!! We really appreciate it. This is a great list of Holiday To-Dos!! Love your photo! So adorable. Thanks! It is a fun one! Hope your holidays were great.